No white rabbits here! 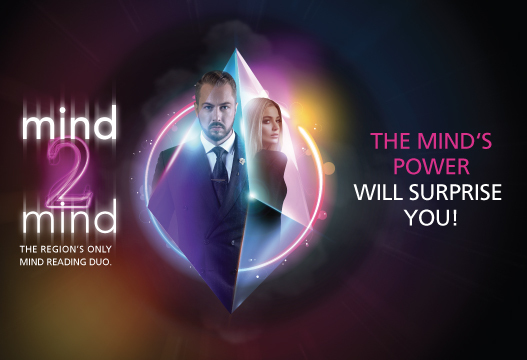 Mall of Qatar, the nation’s favorite destination, invites you to witness Mind 2 Mind, an acclaimed magical duo featuring James Harrington and Marina Argvliani. The duo baffles audience with a wide range of mind reading and magical effects at the Ooredoo Stage every day at 7pm and 8.30pm from December 24th until Saturday January 5th. For the first time in Qatar, residents can experience unique performances of mind reading consisting of multiple feats of mental dexterity. This includes a very rare form of mind reading called ‘second sight’ where Marina can effectively see through the eyes of others without the aid of vision, electronics or codes. Together they create the perfect chemistry to wow any audience. “We are proud to bring another world class show to Qatar and love to see shoppers enjoying spectacular entertainment live on the Ooredoo stage” said Stuart Elder, Mall of Qatar’s CEO. James Harrington, the Gentleman of Magic, is an acclaimed world class magician who has been performing for over 12 years in over 28 countries for countless events. Give a unique experience to your events.